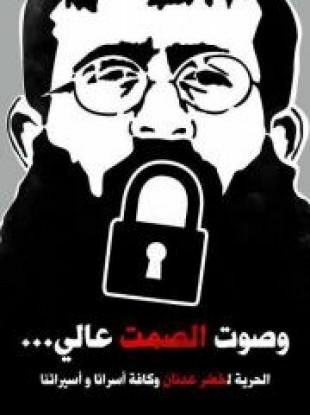 Dozens of Palestinians declared hunger strike in support of the Palestinian prisoner Khader Adnan who has been on hunger strike for 60 days, and has vowed to continue as long as he is imprisoned. Palestinian medical sources said Adnan is facing death if not treated, as many of his major organs, including his heart and stomach are facing imminent failure.A report by Physicians for Human Rights stated that Adnan’s health is seriously deteriorating and that he might die at any moment, as his immune system is not functional any more. Hundreds of Palestinians took to the streets in a number of West Bank towns and cities in support of Adnan, while a number of Palestinians protested at Ofer Military jail near Ramallah. Troops fired tear gas and metal bullets at the protesters. Dr. Mustafa Barghouti, head of the Palestinian National Initiative was wounded with a metal bullet to his foot. Adnan was kidnapped from his home on December 17, 2011 and was placed under administrative detention, he declared hunger strike the day after demanding his immediate release.